Description: The cerata of this nudibranch are more swollen than in other species of Trinchesiidae. The digestive gland is orange pink in colour and the tips of the cerata have a broad white band of tiny epidermal glands. In larger specimens the rhinophores develop a pale orange suffusion. The foot is broad and rounded anteriorly. Large individuals may exceed 20�mm in length. Habitat: Feeds on Tubularia species, especially Tubularia larynx. 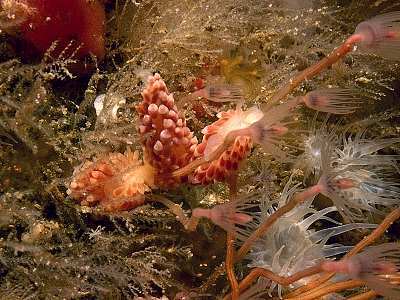 Individuals are usually found amongst the stems of the Tubularia and are thought to feed by eating through the stems rather than on the polyps. Usually found in exposed places, in strong tidal streams, and in shallow water. The spawn consists of curved, lozenge-shaped packets of eggs. Distribution: Found all round the British Isles, and across the Atlantic to eastern North America as well as south to the Bay of Biscay. Similar Species: Similar in coloration to Cuthona nana but with far less cerata and a quite different habitat. Tiny white epidermal glands form white band around tips of cerata. Picton, B.E. & Morrow, C.C. (2016). Catriona aurantia (Alder & Hancock, 1842). [In] Encyclopedia of Marine Life of Britain and Ireland.